I'm sure I've talked about this before, but it bears repeating. Don't just settle for your first view of your subject and leave it at that. If you really want to increase your chances of making your best photograph (and develop your eye for composition along the way), you've got to work your subject. Photograph from a variety of angles, a variety of heights, zoom in or out (by lens or by foot), and experiment with different lighting, if possible. Always ask yourself what attracted you to the subject in the first place, and if your current composition is best highlighting those elements. I can't tell you how often I see photographers approach a subject, fire off a couple of shots at eye-level from the same angle they approached the subject, and then move quickly on to the next subject. If I find a good subject, I can work the subject for hours sometimes (particularly if it is a cooperative animal). Let me give you a real-life example. 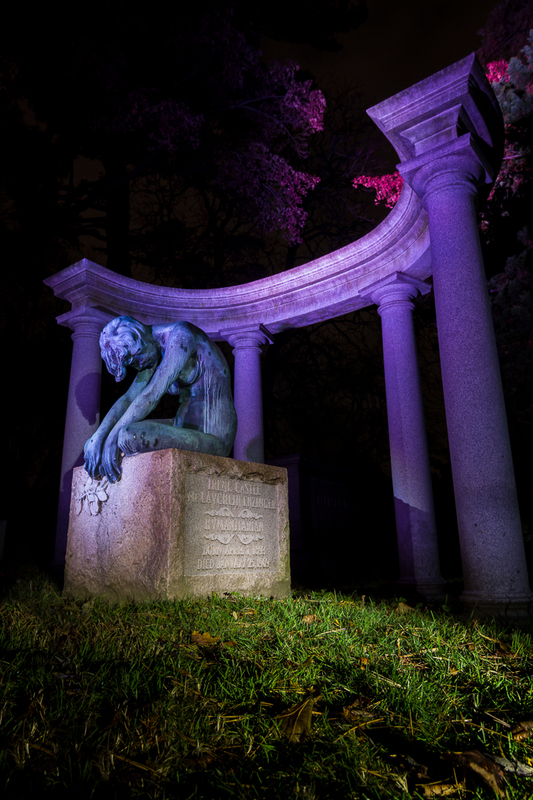 Recently I had the chance to photograph at Woodlawn Cemetery during a night-time tour event where they illuminate some of the famous or interesting mausoleums with colored lights. One monument that really spoke to me was the grave of Vernon and Irene Castle, famous dancers in their day. Irene had seen a small bronze sculpture of an exhausted ballet dancer folded in on herself entitled "The End Of The Day." When Vernon died in a WWI training accident, Irene had the statue recreated for the grave marker. It has a very powerful emotional impact and I knew I had to find a way to do it justice. The first evening I photographed the statue, the colored lights were too close to the front of the statue and thus there were harsh highlights and shadows and the Doric colonnade behind the dancer wasn't fully lit. I tried to balance it with light painting, but I was not happy with the results. For sake of brevity, I'm not including any of those images here, but I still explored the monument from a variety of angles, finding shooting up from lying on the ground at about a 45 degree angle from the front of the statue the most successful. "Broken Dancer No. 1" In my first series of images, I photographed the monument from straight on (parallel with the light source) and only using the colored lights with no additional light painting. I liked how some of the vegetation above the monument was highlighted and how the lit elements stood out starkly against the dark background. Canon 7D, Tokina 11-16mm f/2.8 lens, ISO 100, f/8, 13 seconds. The next day I photographed with my friend Peter Nagy, and we moved the colored lights back a bit, which reduced the harsh shadows/highlights and illuminated the entire monument. In my first series of images, I liked how the lit elements stood out starkly against the black background. I also like how a small portion of the surrounding vegetation caught the light in complimentary colors and form to the monument. So I photographed straight on from in front of the statue at about statue-height, which was kneeling level ("Broken Dancer No. 1"). "Broken Dancer No. 2" In my second series of images, I moved to the left of the statue to capture the rising full super moon in the same frame as the statue. I liked how the combination of the moonlight and direct side lighting from the colored lights outlined the dancer in a dramatic way. I used just a bit of light painting from an angle behind the statue and my camera to just illuminate the inscription on the block and fill in some detail on the dancer's leg. 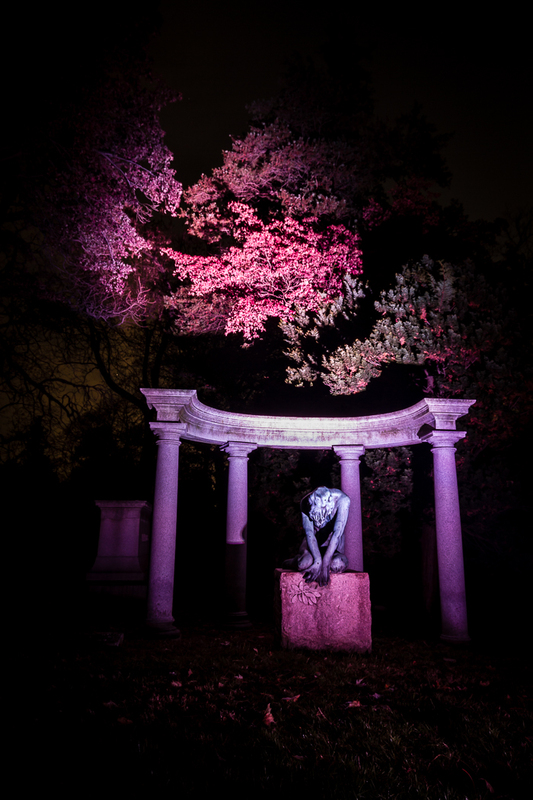 The original light painting was brighter, but I reduced the influence of that layer in Photoshop so I didn't overwhelmed the dramatic lighting of the statue and ruin the dark somber aesthetic of the overall image. An angle from just above eye-level created the most pleasing arrangement of elements. Canon 7D, Tokina 11-16mm f/2.8 lens, ISO 100, f/8, 6 seconds. For the next series, I knew I wanted to capture the full super moon in the frame with the monument, so I moved to the left side of the statue ("Broken Dancer No. 2"). Extending my tripod to full height (just over eye-level when standing on tip-toe for me) gave the most pleasing perspective and arrangement of the elements. The exposure was somewhat limited by the need to not blow out the highlights around the moon or in the center of the Doric colonnade. 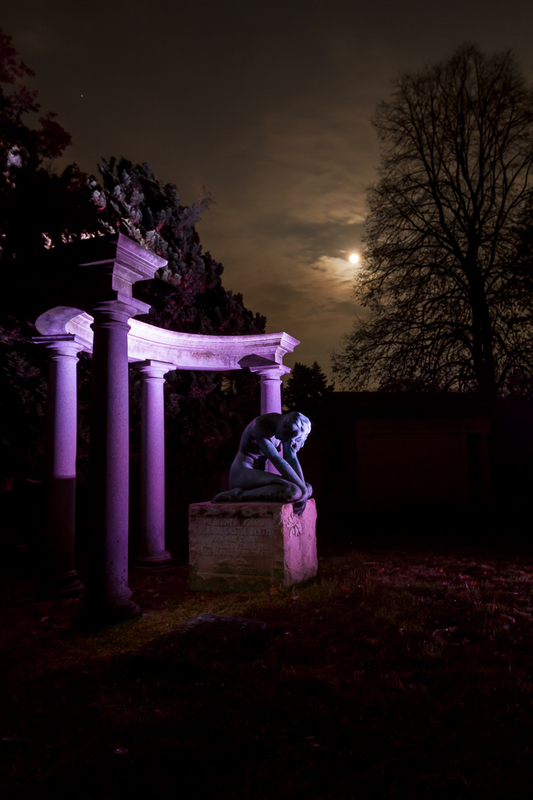 I decided to let detail in the moon itself blow out, as the exposure in the statue was much more important. In a separate capture, I light-painted a bit of the ground and the inscription on the base with a powerful flashlight set to it's lowest power setting. I illuminated from a low angle just behind the statue and my camera. Even then, when I combined the two frames as layers on Lighten mode in Photoshop, I greatly reduced the opacity of the light-painted layer and did some masking to preserve the impact of the dramatic lighting on the statue itself and maintain the overall aesthetic. Also I wanted to keep the viewers eyes mainly to the most important parts of the image, the dancer, the moon, and the colonnade, by keeping them the brightest parts of the image. "Broken Dancer No. 3" In my final series of images, I photographed from my belly on the ground with my tripod legs spread out flat. With the entire Doric colonnade lit with the colored lights this time, the composition was much more successful. It took several tries to get the light painting balanced correctly. Peter used a lower power flashlight to spot the hands during the entire exposure. I used the low power on my spotlight to illuminate the inscription and briefly sweep the dancers face to bring out a bit of detail. This image was captured in a single frame. Canon 7D, Tokina 11-16mm f/2.8 lens, ISO 100, f/8, 5 seconds. Finally, I moved back to the low position on my belly to the front-right of the statue that I had liked the previous evening ("Broken Dancer No. 3"). With the colored lights repositioned, the entire length of the Doric colonnade was illuminated and successfully fulfilled the composition I had envisioned the night before with the colonnade sweeping into the corner of the frame. I had Peter use his comparatively weaker flashlight to hold a spotlight on the hands during the entire 5 second exposure. I then used my spotlight on low power (and not for the entire duration) from towards the back of the statue to illuminate the inscription on the block and to briefly sweep across the underside of the dancers face to bring out a little detail and definition. This was all captured in one shot versus how I often light paint with different lighting captured separately and then combined in Photoshop later. Even now as I look at the image though, I think I might dodge the grass a bit more to make sure the viewers eye is definitely drawn to the statue and the colonnade versus the upper right-hand patch of grass. I hope this helped illustrate the concept of why and how I work a subject. This applies just as much to my nature photography as it does to my night photography. This just happened to be the most recent example I had at hand. I think my favorite image is still "No. 3", which is yours and why? If you like my night photography, be sure to check out the "Night Works" gallery on my new website at http://digitalart.bestnatureimages.com.